The USA Insurance Industry Is Looking To Mitigate Risk And Loss As Arson Attacks Show Up All Around The USA. To be reminded of the power of insurance these days, I just have to step out the front door. I live about 80 miles south of the Camp Fire in northern California, and, even at this distance, the effect is obvious. The color of the air—not something I usually notice—sometimes reminds me of Mordor in the "Lord of the Rings" movies. These wildfires, like every natural disaster, also serve as a reminder of how far we need to go as an industry, and not just to show people the value of insurance and narrow the "protection gap." We need to innovate to provide better, much cheaper policies that will be bought, not sold. We also need to find new business models, including ones based on helping people head off claims—if not from natural disasters, then at least from more controllable issues. Last week, two residential housing tracts under construction were set on fire, after the previous week, when another high density housing project was attacked by fire. "Fire at Gascoigne Lumber Yard on North Queen Anne was arson", Seattle fire officials say. Originally published November 13, 2018 at 11:38 am Updated November 13, 2018 at 7:38 pm. 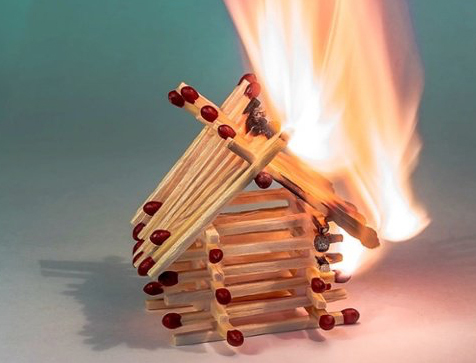 M-Fire Innovation Meets Risk Management with applied science to help mitigate insurance providers risk and loss in order to help builders lower there risk of litigation and loss with the most cost-effective fire protection the building industry has ever seen. Mighty Fire Breaker™ began by defending builders who lost projects during construction, then others who feared losing buildings and now for lowering insurance premiums, since being recognized as the new best practice by insurance providers. Avalon Bay Communities Wins IRMI Innovation Award for there Fire Elimination Plan using Mighty Fire Breaker on 100% of there jobs.